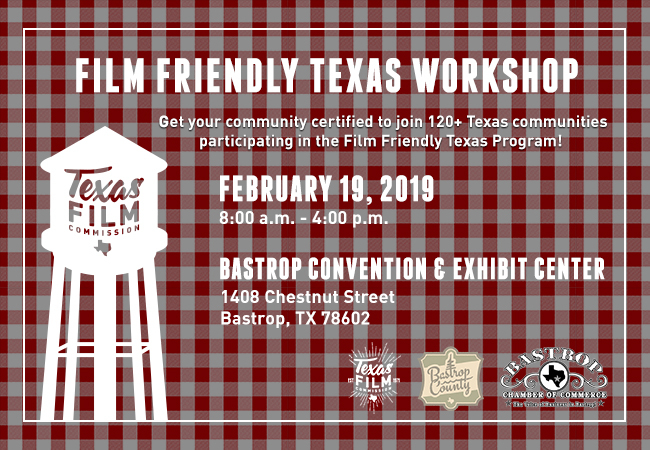 AUSTIN – Governor Greg Abbott today invited communities from around the state to participate in a Film Friendly Texas Workshop on Tuesday, February 19, in Bastrop, one of more than 120 already-certified Film Friendly Texas communities. The workshop, hosted by the Texas Film Commission, is open to Texas community representatives interested in learning about the Texas film production industry and about how to become Film Friendly Texas certified to attract new local jobs and investments. The target audience for this workshop is Texas community representatives who will serve as the community’s point-of-contact for facilitating film requests. Most communities choose a member of their city or county government, Convention and Visitors Bureau, Chamber of Commerce or Economic Development Corporation. The Film Friendly Texas Workshop in Bastrop is being held in partnership with Bastrop County, Visit Bastrop and the Bastrop Chamber of Commerce. Registration is limited to 50 attendees. A reduced lodging rate is available at a hotel near the workshop venue.